It was a detailed tapestry of emotional and sensory experiences, guided and influenced by a strong Native American presence. I was overwhelmed by it’s beauty, and it was the beginning of many visually rich dreams to follow. 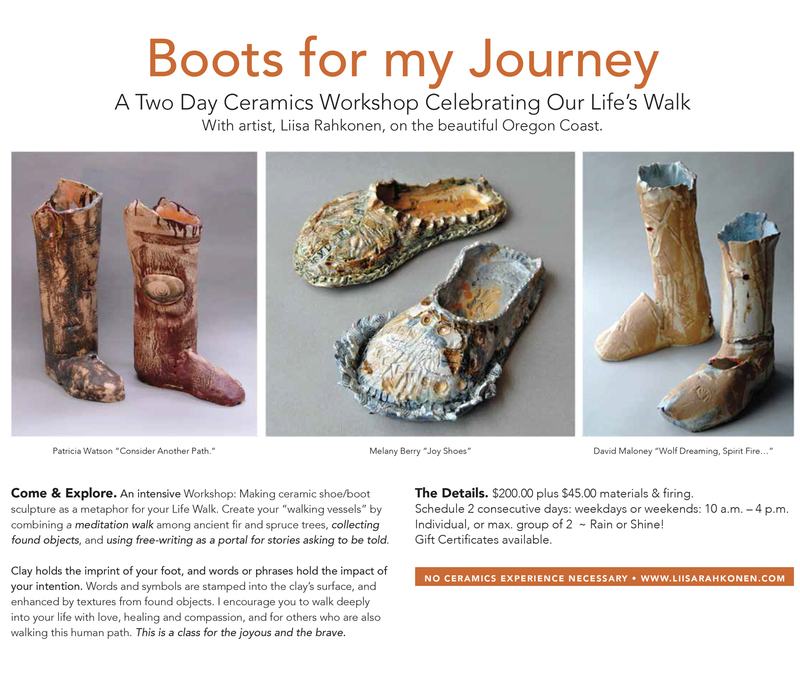 It took eight years to realize this dream was to be shared in the form of a ceramics workshop called, “Boots for My Journey-Walking the Interior Path.” Through art, writing and meditation, students create walking vessels that contain your personal stories in symbols. I encourage students to walk deeply into your life with love, healing, and compassion for yourself, and for others who are also Walking the Interior Path. 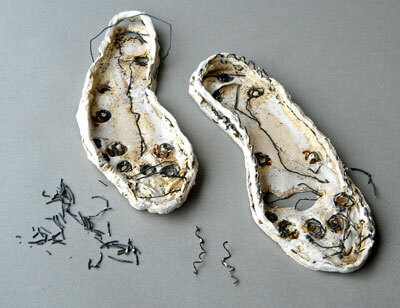 No ceramics experience is necessary to participate in this workshop. This workshop combines a lifelong passion for art with my respect for Native American Spirituality and Ceremony. All Spiritual Paths are welcome. Private Classes are available, please contact me. and a song of grace. I enter the livingroom of a solidly built house. The interior of the home is painted a dusty rose color, reminiscent of a color often used in the 1940’s and 50’s. Each room is vacant, leaving no trace of former occupants or their belongings, and the windows are without curtains or shutters. Summer light fills the room. Behind me and to my left I am aware of the presence of a man who does not reveal himself, but I feel safe as he guides me through the house without speaking a word. He telepathically communicates to me that I have come to this house to meet a “very important person,” but I see no one. With his mind he silently leads me to a staircase with unusually steep wooden steps like those built in old Victorian homes. At the foot of the staircase is a pair of white beaded boots standing rigid, covered by thousands of small white glass beads neatly hand-sewn into rows. 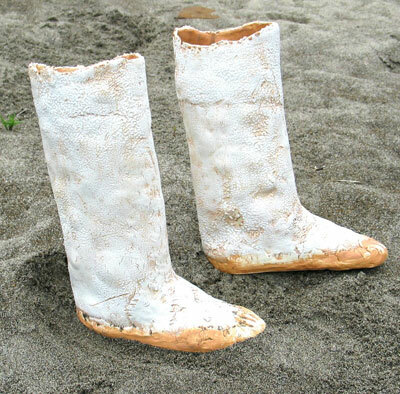 The soles are made of doeskin wrapped around the side and toe of the boots in soft folds. This doeskin tan is the only color next to the white beads. This simplicity reminds me of the color of peace. The only other object in this empty house is a twelve inch square of beadwork sewn onto fabric. It hangs on the wall at my eye level. This beadwork patch looks ancient; it’s threadbare cloth edges are stained with the color of time. There is power in this piece. It has passed through the hands of many people and places with great respect. The design is strong and simple using black, white, red and yellow. I wonder if the beadwork was African or Native American. My telepathic guide leads me to believe that the person I am here to meet is inside the room at the top of the stairs. Standing at the bottom of the staircase and sensing that the boots are there for me, I step into them. They fit perfectly at the foot and around my calf but the leg is too tall and extends above my knee. With some difficulty I try to fold a cuff around the top of each boot so I can bend my legs for climbing the stairs. The heavily encrusted rows of tiny white glass beads are inflexible, but I work slowly and carefully until the boots fit. I look up toward the room and ascend the stairs. With each step I feel an anxious anticipation. There is no hand-railing. I have to be careful. I might fall. Inside the room where I hope to meet a person no human being is present, but I am awestruck by what I do see. Every inch of the ceiling, walls and floor glisten, covered by twelve inch patches of glass beads in black, white, red and yellow like the beaded fabric on the wall at the foot of the stairs. It is like looking into the sky with billions of stars on a clear night, but the stars in the room are glass beads lit from within, sewn together into a pulsating and richly jeweled world. I step into the room and quickly realize the room is alive. The room itself is a living, breathing entity made of billions of beads infused with intelligence and unconditional love. I do not meet a person as expected but instead I encounter a powerful, intelligent, loving essence. Here, in this beaded room, intelligence and love present itself as tangible objects. And yet, at the same time these qualities blow through my body like a current of wind. Tangible and intangible occur simultaneously. I notice that each bead, each point of light, works consciously together while still maintaining it’s individual strength and identity. I feel like I just entered the heart of God.